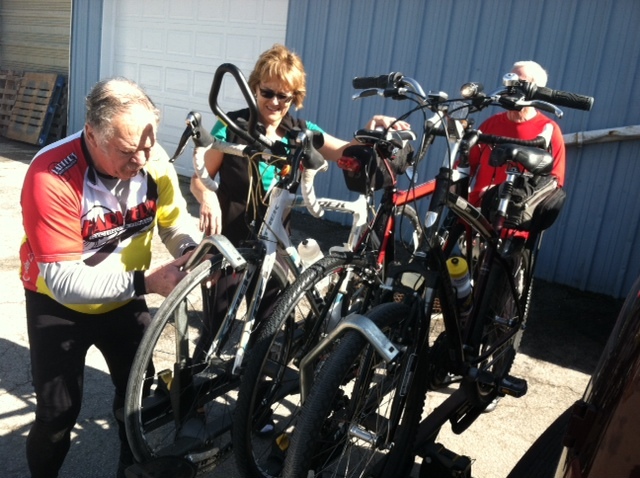 Charlie Harper, from the left, Carol Ward and Chuck Vesey load bikes Tuesday afternoon at Harper's Cycling & Fitness for the tailwind ride they held to celebrate Charlie's 76th birthday. MUSCATINE, Iowa — All bike rides are good — even those held to celebrate the birthday of the 76-year-old guy who led nearly every mile of the 14 we rode today with the wind at our back. Carol Ward, Chuck Vesey and I joined Charlie Harper to celebrate his birthday. For March 6 in Iowa, it was a beautiful day: 73 degrees and sunny, but also really windy with gusts of more than 30 mph out of the southwest. Earlier in the day at the Muscatine Community Y, Chuck had said we would probably ride on the trails and not leave the city limits because of the wind. The plan was to leave from Harper’s Cycling & Fitness at 1:30. Knowing all of this, I left my road bike at home, grabbed my fat-tire hybrid and headed for the bike shop at around 1 p.m. The distance to there from my house is 2.6 miles. I ride it often. But riding into 30 mph wind gusts, I never got above 9 mph and it took me nearly 20 minutes to reach Harper’s. I arrived to find out the plans had changed: Charlie’s wife, Jean, was going to haul us and our bikes somewhere to the south so that we could ride back to Muscatine with the wind at our backs. This was great except it meant I would have to work a little harder to keep up since I wouldn’t be riding a road bike. We started in Louisa County near Lake Odessa. We rode a little over 14 miles and I averaged 16.1 mph. By the time I made it home, I had ridden 20 miles. Another 980 or so and I should be ready for RAGBRAI, which is only 136 days away. It was a good day and a great way to celebrate a birthday. Only God knows if I’ll make it another 31 years. 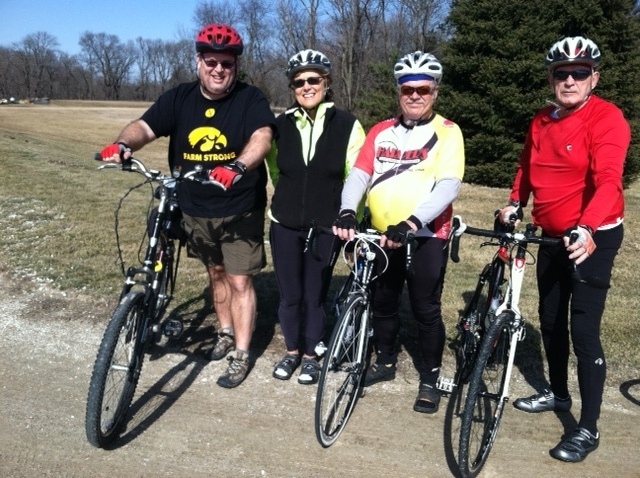 But they will have been well spent if I make it to 76 and am leading the group on that ride the way Charlie did today. What a great way to celebrate a warm March day; even better Charlie’s birthday! ~Kathy J. Love this unexpected “perk” of your current transitional state in that you’re able to join in a 1:30 bike ride on a lovely day. Enjoy it while it lasts, I’m sure you’ll be back in a stuffy ol’ office soon enough. Good for Charlie. I hope we’re all riding at 76! I’m not sure if you can click on my name and find my blog, but if you do and can scroll down, there’s a blurb about my oldest cycling friend at 89. Linnea, thanks for the comment. I found your blog and the item on the 89-year-old cyclist. It made me think of a friend from my days in Winona, Minn. When I knew Joe Emanuel he was in his mid-80s. He was a retired Winona State University professor and World War II veteran who I think could still wear his old uniforms. He worked out at the Y every day. He was a real inspiration. If any of my Winona friends are reading this, maybe they can chime in. If Joe is still alive, he’d have to be in his mid-90s, which, I guess, is possible. I quickly checked newspaper archive and couldn’t find his obit. There is no such thing as a fountain of youth, but staying active is the next-best thing. I liked your blog. I’ll keep reading it. Are you doing RAGBRAI again this year? Thank you for the wonderful post about my Dad. I am so proud he is riding his bike and that he has great friends to ride with. You’re welcome, Deb. I wouldn’t be able to think of enough nice things to say about your parents and the other members of your family who have become some of my best friends.